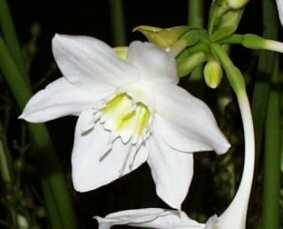 Member of the Amaryllidaceae (amaryllis family). Native to Colombia and Peru. Related species include onion, Narcissus, Nerine, Zephyranthes. Tubular flowers with flared petals and a central cup to 3 inches across occur in a cluster of 3-6 at stem end. Stems leafless, to 12-18 inches long. Plant is a herbaceous perennial from a bulb. 45-59 F, individual flowers stored dry in airtight boxes and misted with water. From Greek “eu” (good) and “charis” (attraction), in reference to the blooms. The specific epithet name grandiflora means large flowers. Used in corsages and wedding arrangements.